Singles Knockout winner - Paul Kilpatrick. Singles Knockout runner up - Glen Kilpatrick. Doubles Knockout winners - Glen Kilpatrick & Colin Stainthorpe. Doubles Knockout runners up - Brian Harland & James Gilpin. Heaviest Fish out of competition - Mike Vasey - 10 lb 01 oz. Christmas match winner - Rob Allison - 17 lb 05 oz - 7 fish. 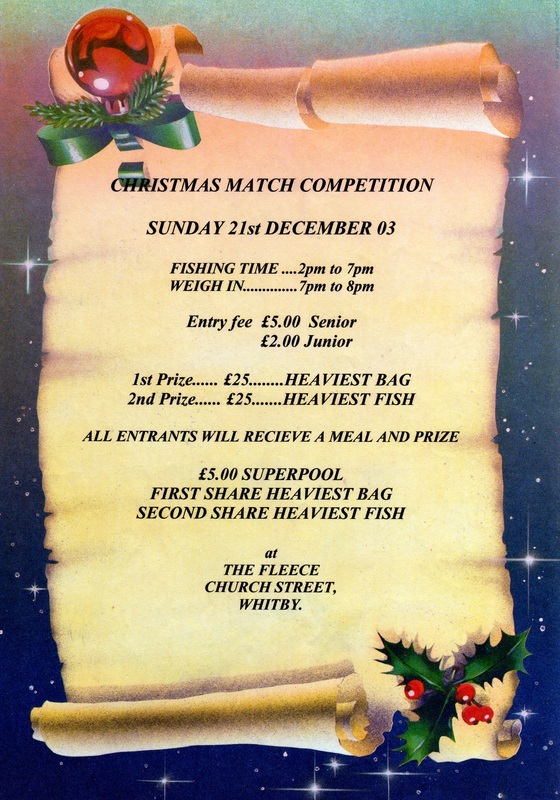 Christmas match Heaviest Fish - Phil Mead - 6 lb 02 oz. Greatest number of fish - Rob Allison - 132 fish. 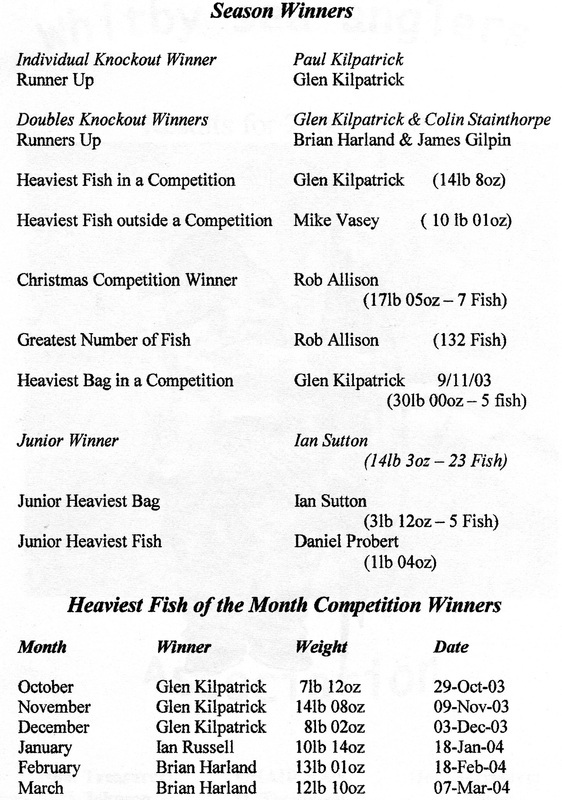 Heaviest Bag of Fish - Glen Kilpatrick - 30 lb 00 oz - 5 fish (Sunday 9th November 2003). 1st - Ian Sutton - 14 lb 03 oz - 23 fish. 2nd - Daniel Probert - 13 lb 06 oz - 21 fish. Junior Heaviest Bag - Ian Sutton - 3 lb 12 oz - 5 fish. Junior Heaviest Fish - Dan Probert - 1 lb 04 oz. Total weight for the season - 2,066 lb 01 oz. Total Number of fish - 1,342. Hon. Treasurer - Dave Johnson. Hon. Secretary - Bernard Vasey. Notes:- PDH 28-12-2012 taken from the ledger. 5th October 2003 Heaviest Bags. Paul Kilpatrick - 16 lb 04 oz - 5 fish. Bernard Vasey - 14 lb 04 oz - 4 fish. Brian Harland - 10 lb 04 oz - 4 fish. 12th October 2003 Heaviest Bags. Denis Thompson - 20 lb 11 oz - 6 fish. Dave Perrett - 10 lb 00 oz - 8 fish. 15th October 2003 - Rob Allison Heaviest Bag - 10 lb 08 oz - 6 fish. 19th October 2003 Heaviest bags. Denis Thompson - 13 lb 10 oz - 5 fish. Brian Harland - 10 lb 10 oz - 8 fish. 22nd October 2003 - Rob Allison Heaviest Bag - 12 lb 03 oz - 6 fish. 26th October 2003 - Heaviest Bags. Dave Perrett - 15 lb 12 oz - 4 fish. Denis Thompson - 10 lb 05 oz - 4 fish. William Atkinson - 10 lb 00 oz - 5 fish. 29th October 2003 - Heaviest Bags. Glen Kilpatrick - 10 lb 14 oz - 3 fish. 9th November 2003 - Heaviest Bags. Glen Kilpatrick - 30 lb 00 oz - 5 fish, including one of 14 lb 08 oz. Denis Thompson - 18 lb 03 oz - 8 fish. Ian Russell - 15 lb 07 oz - 9 fish. 16th November 2003 - Heaviest Bags. Colin Stainthorpe - 21 lb 14 oz - 6 fish. Brian Harland - 14 lb 00 oz - 8 fish. 30th November 2003 - Phil Mead Heaviest Bag - 11 lb 11 oz - 20 fish. 7th December 2003 - Heaviest Bags. Rob Allison - 28 lb 07 oz - 10 fish. Denis Thompson - 24 lb 01 oz - 10 fish. William Atkinson - 19 lb 04 oz - 7 fish. Ian Russell - 14 lb 14 oz - 5 fish. Brian Harland - 11 lb 06 oz - 4 fish. 18th January 2004 - Heaviest Bags. Ian Russell - 27 lb 06 oz - 7 fish, including one fish of 10 lb 14 oz. Denis Thompson - 22 lb 07 oz. 21st January 2004 - Brian Harland Heaviest bag - 12 lb 11 oz - 3 fish. 15th February 2004 - William Atkinson Heaviest bag - 12 lb 04 oz - 4 fish. 28th January 2004 - Mike Vasey Heaviest Fish - 9 lb 06 oz. 18th February 2004 - Brian Harland Heaviest Bag - 25 lb 07 oz - 5 fish. 29th February 2004 - Brian Harland Heaviest Bag - 12 lb 05 oz - 5 fish. 7th March 2004 - Brian Harland Heaviest Bag - 19 lb 07 oz - 3 fish. 10th March 2004 - Denis Thompson Heaviest Bag - 12 lb 05 oz - 2 fish. 21st March 2004 - Brian Harland Heaviest Bag - 11 lb 02 oz - 2 fish. 24th March 2004 - Colin Stainthorpe Heaviest Bag - 14 lb 08 oz - 2 fish. As reported by Bernard Vasey. 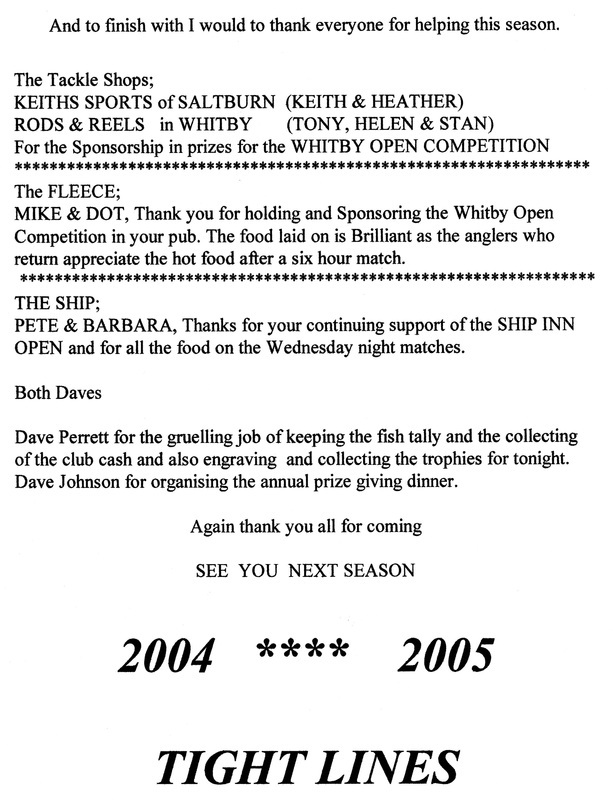 Whitby Sea Anglers took to the shores as their 2003 - 2004 new season got under way, and not for the next 6 months will be fishing every Sunday (6-10) and Wednesday (7-10). The first competition was fished to a flooding to top of tide match on a fairly clear warm night with only little movement on the shore. Dave Perrett, 4 codling for 5 lb 13 oz. 2nd - Ian Russell - 2 lb 06 oz - 2 fish. 3rd - Jason Ebison - 2 lb 00 oz - 4 fish. 4th - Denis Thompson - 1 lb 15 oz. 5th Colin Stainthorpe - 0 lb 09 oz - 1 fish. A change in the weather conditions on the Saturday as a north westerly rough sea kept the charter boats in port during their 14 day Autumn Festival, but these types of seas favour the shore anglers. The Sunday evening club match showed a good result fishing a slow half ebbing to low water tide a total of 41 assorted fish, mostly codling were weighed in. The heaviest fish was caught by Dave Perrett, 5 lb 13 oz, this sets the target for the Heaviest Fish of the Month for October. Winning the match with 5 codling Paul Kilpatrick weighed in the seasons first double figure bag of 16 lb 04 oz. 1st - Paul Kilpatrick - 16 lb 04 oz - 5 fish. 2nd - Bernard Vasey - 14 lb 07 oz - 4 fish. 3rd - Brian Harland - 10 lb 04 oz - 4 fish. 4th - Dave Perrett - 8 lb 08 oz - 3 fish. 5th Glen Kilpatrick - 5 lb 12 oz - 2 fish. 6th - Ian Russell - 5 lb 00 oz - 4 fish. 7th - James Gilpin - 4 lb 14 oz - 4 fish. 8th - Mike Ayton - 3 lb 14 oz - 2 fish. 9th - George Middlemas - 3 lb 09 oz - 3 fish. 10th - Colin Stainthorpe - 3 lb 03 oz - 3 fish. 11th - Denis Thompson - 2 lb 08 oz - 1 fish. 12th - Rob Allison - 2 lb 06 oz - 1 fish. 13th - Mike Vasey - 1 lb 03 oz - 2 fish. 14th - Paul Dryden - 1 lb 00 oz - 2 fish. 15th - Jason Ebison - 0 lb 08 oz - 1 fish. The north westerly rough sea that was fished the previous sunday did not last for the midweek match on the wednesday as the strong wind swept round to the west flattening the sea. Anglers were casting to an ebbing tide and a strong wind, the best fish of the night was caught by Ian Russell a 4 lb 02 oz, in his winning bag of 7 lb 00 oz. 1st - Ian Russell - 7 lb 00 oz - 3 fish. 2nd - Denis Thompson - 6 lb 12 oz - 4 fish. 3rd - Paul Short - 5 lb 05 oz - 3 fish. 4th - Glen Kilpatrick - 4 lb 03 oz - 2 fish. 5th - Brian Harland - 4 lb 00 oz - 3 fish. 6th - Colin Stainthorpe - 1 lb 15 oz - 2 fish. 7th - Daniel Probert (Jnr) - 1 lb 15 oz - 2 fish. 8th - Malcolm Pitman - 1 lb 08 oz - 1 fish. 9th - William Atkinson - 1 lb 07 oz - 1 fish. 10th - Phil Mead - 1 lb 06 oz - 2 fish. 11th - Dave Perrett - 1 lb 02 oz - 1 fish. 12th - Paul Kilpatrick - 0 lb 14 oz - 1 fish. The Sunday 4 hr match was fished to a 5.3 metre high tide and another change in seas conditions turning to a south easterly close to shore swell. It was a better result than on wednesday with more codling on the scales, the best bag of the season was increased to 20 lb 11 oz from 6 codling by Denis Thompson, his best fish weighing 5 lb 02 oz. 1st - Denis Thompson - 20 lb 11 oz - 6 fish. 2nd - Dave Perrett - 10 lb 00 oz - 8 fish. 3rd - James Gilpin - 6 lb 09 oz - 4 fish. 4th - Jason Ebison - 3 lb 14 oz - 2 fish. 5th - Brian Harland - 3 lb 09 oz - 2 fish. 6th - George Middlemas - 3 lb 05 oz - 1 fish. 7th - Glen Kilpatrick - 2 lb 05 oz - 2 fish. 8th - Bernard Vasey - 1 lb 15 oz - 1 fish. 9th - William Atkinson - 0 lb 12 oz. Redcar Navy & Gentlemans Open - 26th October. The club match was fished to a high tide ebbing from an easterly running sea swell that produced a total of 28 assorted small fish of codling, whiting and rocklings. Rob Allison clear winner. 1st - Rob Allison - 10 lb 08 oz - 6 fish. 2nd - Dave Perrett - 2 lb 11 oz - 2 fish. 3rd - Paul Kilpatrick - 2 lb 03 oz - 2 fish. 4th - Colin Stainthorpe - 2 lb 02 oz - 2 fish. 5th - Brian Harland - 1 lb 14 oz - 2 fish. 6th - Mike Vasey - 1 lb 13 oz - 1 fish. 7th - Denis Thompson - 1 lb 10 oz - 2 fish. 8th - Phil Mead - 1 lb 09 oz - 3 fish. 9th - Jason Ebison - 1 lb 09 oz - 3 fish. 10th - Daniel Probert (Jnr) - 1 lb 01 oz - 2 fish. 11th - Ian Sutton - 0 lb 10 oz - 1 fish. 12th - William Atkinson - 0 lb 08 oz - 1 fish. A change in the weather conditions for sunday match as a north easterly strong wind made the night colder of as late and making the flooding tide a rough sea state. The strong wind also made casting difficult but 3 anglers caught a few decent fish in the 5 lb range with only 19 fish weighed in. The winner was Denis Thompson, who caught his second double figure bag of fish with 13 lb 10 oz. Brian Harland also catching his second double figure bag. 1st - Denis Thompson - 13 lb 10 oz - 5 fish. 2nd - Brian Harland - 10 lb 10 oz - 8 fish. 3rd - Dave Perrett - 8 lb 01 oz - 3 fish (1 of 5 lb 07 oz). 4th - Paul Kilpatrick - 1 lb 12 oz - 1 fish. 5th - Bernard Vasey - 1 lb 07 oz - 1 fish. 6th - Paul Dryden - 0 lb 15 oz - 1 fish. This weekend - Redcar Navy & Gentlemans Open - 26th October. Whitby Sea Anglers fished a half ebbing tide on a dark and unsettled night as the scaurs were lit with flashes of fork lightning followed by thunder with patches of sleet and rain. Despite these conditions 10 anglers managed to catch a fish, Rob Allison won with 6 codling for 12 lb 03 oz. 1st - Rob Allison - 12 lb 03 oz - 6 fish. 2nd - Denis Thompson - 6 lb 14 oz - 3 fish. 3rd - Phil Mead - 6 lb 01 oz - 3 fish. 4th - Paul Kilpatrick - 5 lb 08 oz - 3 fish. 5th - Colin Stainthorpe - 5 lb 02 oz - 4 fish. 6th - Dave Perrett - 4 lb 08 oz - 4 fish. 7th - Glen Kilpatrick - 3 lb 03 oz - 2 fish. 8th - Paul Short - 1 lb 10 oz - 1 fish. 9th - Mike Vasey - 1 lb 07 oz - 1 fish. 10th - Brian Harland - 0 lb 14 oz - 1 fish. Paul Kilpatrick beat Colin Stainthorpe 5-8 to 5-2. Phil Mead beat Bernard Vasey 6-1 to nil. Dave Perrett beat Mike Davies 4-8 to nil. Sundays match gave the best results for this season on a fine evening anglers fished a 6 metre high tide ebbing with plenty of colour back in the water from a northern sea swell with a total of 57 fish from 16 anglers. 1st - Dave Perrett - 15 lb 12 oz - 4 fish. 2nd - Denis Thompson - 10 lb 05 oz - 4 fish. 3rd - William Atkinson - 10 lb 00 oz - 5 fish. 4th - Colin Stainthorpe - 9 lb 10 oz - 3 fish. 5th - George Middlemas - 6 lb 14 oz - 6 fish. 6th - Brian Harland - 6 lb 10 oz - 4 fish. 7th - Ian Russell - 6 lb 07 oz - 4 fish. 8th - Paul Kilpatrick - 6 lb 02 oz - 4 fish. 9th - Mike Vasey - 5 lb 13 oz - 4 fish. 10th - Rob Allison - 5 lb 11 oz - 3 fish. 11th - Ian Sutton (Jnr) - 3 lb 12 oz - 5 fish. 12th - James Gilpin - 3 lb 11 oz - 2 fish. 13th - Bernard Vasey - 3 lb 06 oz - 2 fish. 14th - Glen Kilpatrick - 3 lb 04 oz - 1 fish. 15th - Daniel Probert (Jnr) - 2 lb 12 oz - 5 fish. 16th - Jason Ebison - 2 lb 02 oz - 1 fish. 1st - Rob Allison with 19 lb 01 oz. 2nd - Ray Maddison with 16 lb 04 oz. 3rd - Andy Crowe with 7 lb 10 oz. John Smiths Open Filey 9th November 2003. Whitby Open 23rd November 2003. A calm sea on the morning changed by the time the match had started, with the help of a close to shore ebbing sea swell that produced two double figure bags of codling. Glen Kilpatrick not only won the match with his catch of 10 lb 14 oz from 3 fish but also clinched the heaviest fish of the month for October of 7 lb 12 oz. 1st - Glen Kilpatrick - 10 lb 14 oz - 3 fish. 2nd - Denis Thompson - 10 lb 10 oz - 3 fish. One over 5 lbs. 3rd - Phil Mead - 8 lb 12 oz - 15 whiting. 4th - 5 lb 12 oz - 10 whiting. 5th - Ian Russell - 4 lb 01 oz - 3 fish. 6th - Mike Davies - 3 lb 00 oz - 2 fish. 7th - Brian Harland - 2 lb 06 oz - 4 fish. 8th - Dave Perrett - 2 lb 01 oz - 3 fish. 9th - Mike Vasey - 1 lb 09 oz. 10th - Bernard Vasey - 1 lb 15 oz - 1 fish. 11th - Paul Short - 1 lb 03 oz - 1 fish. The sunday match saw a very calm sea as a slow flooding tide pushed in on a dry clear night and another mixed catch of small fish were weighed in.The winning bag was caught by Denis Thompson. 1st - Denis Thompson - 7 lb 03 oz - 4 fish. 2nd - Paul Kilpatrick - 4 lb 04 oz - 4 fish. 3rd - Brian Harland - 4 lb 02 oz - 7 fish. 4th - Phil Mead - 3 lb 02 oz - 2 fish. 5th - Jason Ebison - 2 lb 10 oz - 5 fish. 6th - Dave Perrett - 2 lb 10 oz - 2 fish. 7th - James Gilpin - 1 lb 15 oz - 2 fish. 8th - Colin Stainthorpe - 1 lb 11 oz - 2 fish. 9th - George Middlemas - 1 lb 08 oz - 3 fish. 10th - William Atkinson - 1 lb 03 oz - 2 fish. 11th - Bernard Vasey - 1 lb 00 oz - 2 fish. 12th - Rob Allison - 0 lb 15 oz - 1 fish. 13th - Ian Russell - 0 lb 09 oz - 1 fish. 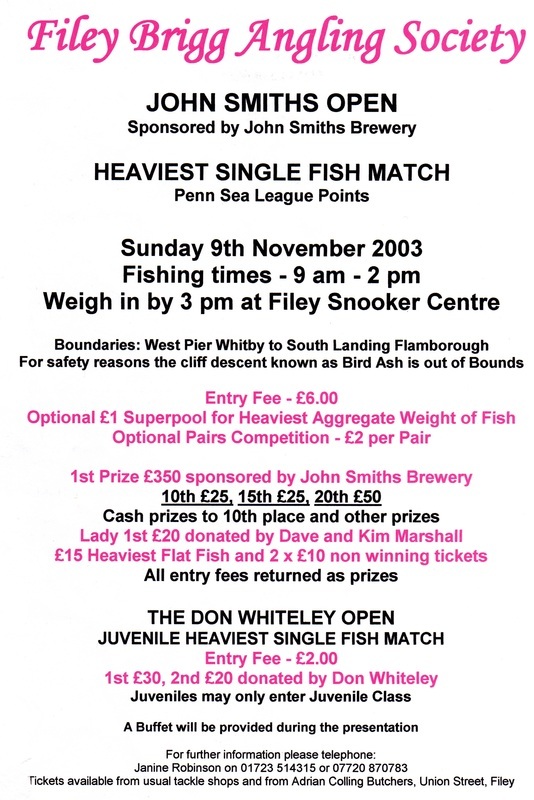 John Smith's Open Filey 9th November 2003. Whitby Open 3rd November 2003. Twenty fish were caught in the midweek match as anglers fished to a half ebbing southerly sea swell with very little colour in the water. 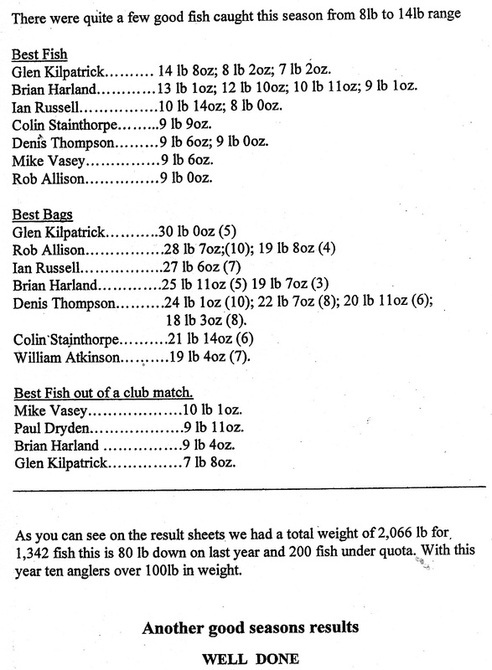 The best bag of fish was weighed in by Glen Kilpatrick. 1st - Glen Kilpatrick - 7 lb 14 oz - 4 codling. 2nd - Phil Mead - 7 lb 03 oz - 3 fish. 3rd - Dave Perrett - 6 lb 12 oz - 4 fish. 4th - Paul Kilpatrick - 5 lb 07 oz - 4 fish. 5th - William Atkinson - 2 lb 04 oz - 2 fish. 6th - Jason Ebison - 1 lb 10 oz - 3 fish. 7th - Mike Vasey - 1 lb 06 oz - 1 fish. 8th - Ian Russell - 1 lb 01 oz - 2 fish. 9th - Ian Sutton (Jnr) - 0 lb 14 oz - 2 fish. A dry night for the fishing match from 6pm to 10pm produced the best catches of the season to date as anglers were fishing a high tide fast ebbing to an improved south easterly sea swell but still lacking cloudy colour of the water. A total of 61 fish were weighed in for a combined total of 131 lb 10 oz, four anglers having double figure bags. The best bag and fish were caught by Glen Kilpatrick winning with 5 fish for 30 lb 00 oz, he also weighed in the heaviest fish of the season of 14 lb 08 oz, Glen seems to be finding the larger fish as he caught a 7 lb 08 oz cod out of a club match last week. 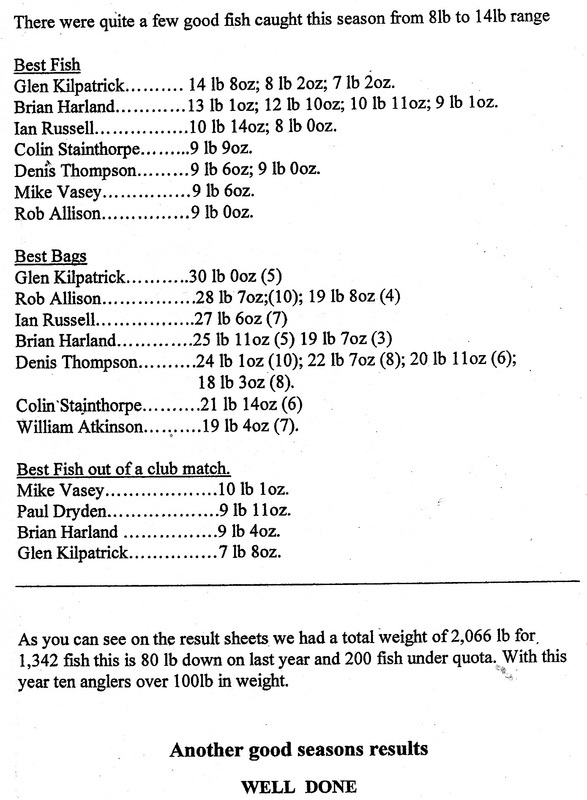 1st - Glen Kilpatrick - 30 lb 00 oz - 5 fish. 2nd - Denis Thompson - 18 lb 03 oz - 8 fish. 3rd - Ian Russell - 15 lb 07 oz - 9 fish. 4th - Brian Harland - 11 lb 09 oz - 6 fish. 5th - William Atkinson - 9 lb 10 oz - 3 fish. 6th - Rob Allison - 8 lb 12 oz - 4 fish. 7th - Jason Ebison - 6 lb 12 oz - 5 fish. 8th - Phil Mead - 6 lb 03 oz - 3 fish. 9th - George Middlemas - 5 lb 15 oz - 4 fish. 10th - Dave Perrett - 5 lb 00 oz - 2 fish. 11th - Mike Vasey - 2 lb 15 oz - 2 fish. 12th - Ian Sutton (Jnr) - 2 lb 09 oz - 4 fish. 13th - Paul Dryden - 2 lb 02 oz - 1 fish. 14th - Colin Stainthorpe - 1 lb 13 oz - 1 fish. 15th - Bernard Vasey - 1 lb 10 oz - 1 fish. 16th - Paul Kilpatrick - 1 lb 05 oz - 1 fish. 17th - James Gilpin - 1 lb 04 oz - 1 fish. 18th - Daniel Probert (Jnr) - 0 lb 08 oz - 1 fish. The sea had returned to a calm state for the match with only slight easterly movement on a fine night anglers were not expecting a repeat performance of last sunday's good catch. With a high tide ebbing they search for marks that may produce a few codling. There was only a catch of assorted fish weighed in of whiting, rockling and small codling. The best bag was Glen Kilpatrick who won his third match in a row with 8 lb 12 oz from 3 codling. 1st - Glen Kilpatrick - 8 lb 12 oz - 3 fish. 2nd - Denis Thompson - 3 lb 13 oz - 2 fish. 3rd - Paul Kilpatrick - 3 lb 01 oz - 3 fish. 4th - Dave Perrett - 2 lb 13 oz - 3 fish. 5th - Ian Russell - 2 lb 06 oz - 2 fish. 6th - Rob Allison - 1 lb 12 oz - 3 fish. 7th - William Atkinson - 1 lb 11 oz - 1 fish. 8th - Ian Sutton (Jnr) - 1 lb 07 oz - 2 fish. 9th - Daniel Probert (Jnr) - 0 lb 14 oz - 1 fish. 11th - Jason Ebison - 0 lb 08 oz - 1 fish. 12th - Malcolm Pitman - 0 lb 07 oz - 1 fish. In the competition two anglers returned with double figure bags of fish on a night when bites to most club anglers were few. From a half flooding slight west north westerly moving sea swell the 4 hr evening match gave Colin Stainthorpe his best catches of this season weighing in 6 fish for 21 lb 14 oz, his best 5 lb 12 oz. 1st - Colin Stainthorpe - 21 lb 14 oz - 6 fish. 2nd - Brian Harland - 14 lb 00 oz - 8 fish. 3rd - Denis Thompson - 7 lb 13 oz - 4 fish. 4th - Dave Perrett - 6 lb 04 oz - 4 fish. 5th - Phil Mead - 2 lb 12 oz - 2 fish. 6th - James Gilpin - 1 lb 14 oz - 3 fish. 7th - Mike Vasey - 1 lb 12 oz - 1 fish. 8th - William Atkinson - 1 lb 06 oz - 1 fish. 9th - George Middlemas - 1 lb 03 oz - 1 fish. 10th - Paul Kilpatrick - 0 lb 08 oz - 1 fish. 1st - Jason Ebison - 5 lb 14 oz - 11 fish. 2nd - Malcolm Pitman - 3 lb 06 oz - 5 fish. 3rd - Rob Allison - 2 lb 02 oz - 4 fish. 4th - Colin Stainthorpe - 2 lb 00 oz - 2 fish. 5th - Phil Mead - 1 lb 13 oz - 2 fish. 6th - Denis Thompson - 1 lb 09 oz - 2 fish. 7th = William Atkinson - 0 lb 09 oz - 1 fish. 7th = Daniel Probert - 0 lb 09 oz - 1 fish. 9th - Glen Kilpatrick - 0 lb 07 oz - 1 fish. Whitby Sea Anglers Associations Annual Open shore angling competition was fished to a calm fast flooding tide on a very frosty morning. Although the sea was quite clear at most marks a total of 26 anglers weighed in a total of 160 lb of fish with 5 having double figure bags of fish. 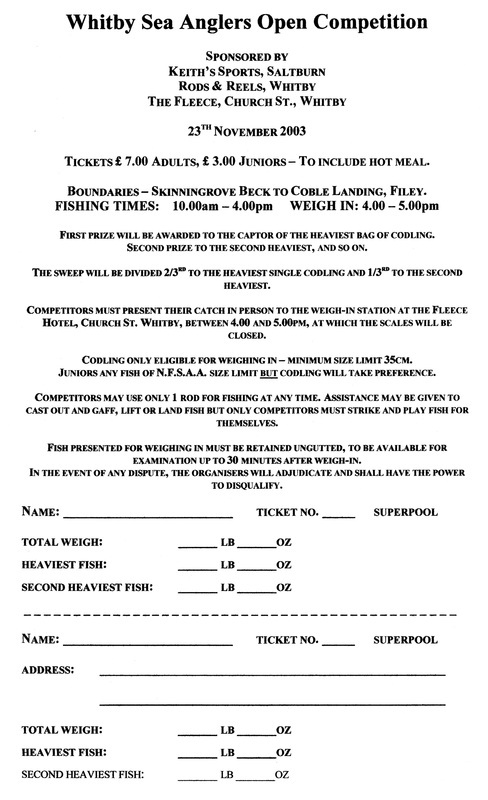 The 6 hr match fishing time from 10am to 4pm with the weigh in from 4 pm to 5pm at the Fleece, Church Street, Whitby, where the prize presentations were held, attracted 107 anglers fishing in the boundaries along the coast from Skinningrove beck to Coble Landing, Filey. The 1st prize of £400 and the Whitby Open Trophy were presented to Scarborough angler Jeremy Robinson with a catch of 20 lb 05 oz - 7 fish. 2nd prize £200 went to last years winner Rob Allison of Loftus 16 lb 03 oz - 5 fish. 3rd prize £150 to Chris Scaife of Filey with 13 lb 03 oz. The sweep for the Heaviest single Fish was won by James Moore of Redcar with a fine fish of 11 lb 10 oz. 2nd Heaviest Fish to William Atkinson of Egton with 7 lb 09 oz. 4th - James Moore - 11 lb 10 oz - 1 fish. 5th - Ray Maddison - 10 lb 03 oz - 3 fish. 6th - Paul Atkinson - 9 lb 13 oz - 3 fish. 7th - J Hoxby - 7 lb 10 oz - 2 fish. 8th - William Atkinson 7 lb 09 oz - 1 fish. 9th - Mick Wright - 7 lb 02 oz - 3 fish. 10th - Bernard Westgarth - 6 lb 02 oz - 1 fish. Unfortunately no junior weighed in. 14th December 2003 - Cloughton Rock Anglers Open. 18 members entered and 5 weighed in !! 16 lb 03 oz - 5 fish. 7 lb 09 oz - 1 fish. 3 lb 14 oz - 1 fish. 3 lb 12 oz - 2 fish. There was a good result from last nights match even though the sea conditions on the night were not perfect with only close to shore movement there was a total of 101 fish from 19 anglers weighed in, most of these fish were whiting taking 1st and 2nd places. The heaviest fish of 6 lb 07 oz caught by Adrian Nelson and a cod of 4 lb 10 oz from Mike Davies. 1st - Rob Allison - 8 lb 11 oz - 15 whiting. 2nd - Richard Parkin - 8 lb 10 oz - 14 whiting. 3rd - Dave Perrett - 7 lb 14 oz - 2 cod. 4th - Paul Kilpatrick - 7 lb 08 oz - 5 fish. 5th - William Atkinson - 7 lb 04 oz - 3 fish. 6th - Jason Ebison - 7 lb 03 oz - 14 fish. 7th - Brian Harland - 7 lb 12 oz - 12 fish. 8th - Mike Davies - 6 lb 15 oz - 2 fish. 9th - Bernard Vasey - 6 lb 13 oz - 10 fish. 10th - Ian Russell - 6 lb 11 oz - 4 fish. 11th - Adrian Nelson - 6 lb 07 oz - 1 fish. 12th - Denis Thompson - 6 lb 07 oz - 4 fish. 13th - Glen Kilpatrick - 4 lb 08 oz - 3 fish. 14th - Colin Stainthorpe - 3 lb 15 oz - 2 fish. 15th - Mike Vasey - 3 lb 11 oz - 2 fish. 16th - Malcolm Pitman - 2 lb 13 oz - 3 fish. 17th - Paul Dryden - 1 lb 14 oz - 1 fish. 18th - Daniel Probert (Jnr) - 1 lb 00 oz - 1 fish. 19th - Ian Sutton (Jnr) - 1 lb 00 oz - 1 fish. Sunday was another calm clear sea state except anglers were fishing to a flooding tide, again the majority of the fish were whiting with only 5 codling. The match was won by Phil Mead with 20 fish for 11 lb 11 oz. 1st - Phil Mead - 11 lb 11 oz - 20 fish. 2nd -Dave Perrett - 6 lb 00 oz - 10 fish. 3rd - Glen Kilpatrick - 5 lb 07 oz - 2 fish. 4th - Bernard Vasey - 4 lb 14 oz - 7 fish. 5th - Richard Parkin 4 lb 03 oz - 8 fish. 6th - James Gilpin - 3 lb 03 oz - 6 fish. 7th - Rob Allison - 2 lb 05 oz - 4 fish. 8th - Jason Ebison - 1 lb 14 oz - 4 fish. 9th - Denis Thompson - 1 lb 06 oz - 1 fish. 10th - Brian Harland - 1 lb 03 oz - 2 fish. Cloughton Open 14th December 2003. 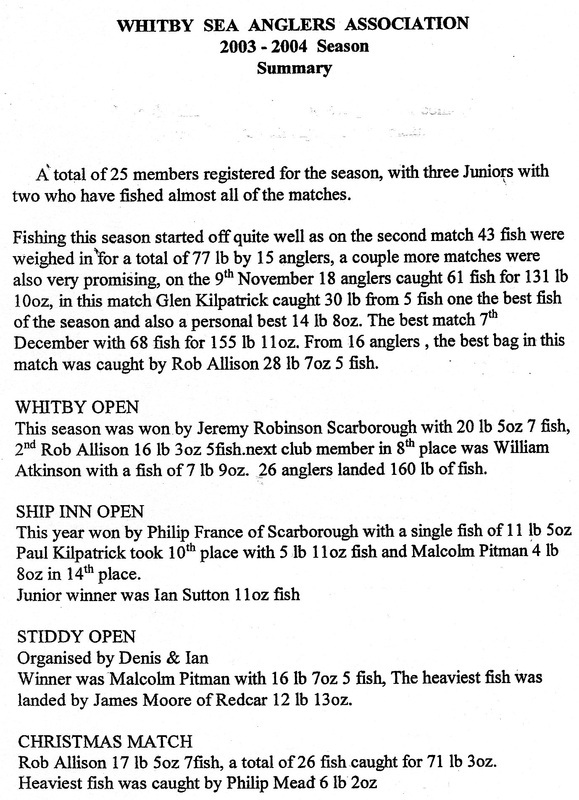 The winter shore angling for Whitby Sea Anglers Association entered into its third month of the ix month season and the first match into December started off well even though the sea swell had only just begun to lift a little as the tide slowly flooded in. Again Glen Kilpatrick choose a mark that produced a good fish of 8 lb 02 oz on his first cast of the match, a second fish took his weight to 9 lb 12 oz to win. 1st - Glen Kilpatrick - 9 lb 12 oz - 2 fish. 2nd - Denis Thompson - 9 lb 11 oz - 4 fish. 3rd - Phil Mead - 7 lb 01 oz - 3 fish. 4th - Malcolm Pitman - 7 lb 00 oz - 8 fish. 5th - Rob Allison - 6 lb 09 oz - 2 fish. 6th - Brian Harland - 6 lb 06 oz - 5 fish. 7th - George Middlemas - 3 lb 12 oz - 2 fish. 8th - Dave Perrett - 2 lb 13 oz - 3 fish. 9th - William Atkinson - 1 lb 03 oz - 1 fish. 10th - Bernard Vasey - 0 lb 11 oz - 1 fish. 11th - Daniel Probert (Jnr) - 0 lb 07 oz - 1 fish. An ebbing easterly sea swell on the night allowed anglers to follow the tide out and fish the best low water marks, this resulted in the best weigh in this season. There were a few fish in the 5 lb and 6 lb range with a total of 68 fish for 155 lb 11 oz, 5 anglers with double figure bags.1st - Rob Allison - 28 lb 07 oz - 10 fish. 2nd - Denis Thompson - 24 lb 01 oz - 10 fish. 3rd - William Atkinson - 19 lb 04 oz - 7 fish. 4th - Ian Russell - 14 lb 14 oz - 5 fish. 5th - Brian Harland - 11 lb 06 oz - 4 fish. 6th - Mike Vasey - 9 lb 02 oz - 5 fish. 7th - George Middlemas - 8 lb 01 oz - 4 fish. 8th - Glen Kilpatrick - 7 lb 10 oz - 4 fish. 9th - Malcolm Pitman - 7 lb 05 oz - 2 fish. 10th - Jason Ebison - 6 lb 01 oz - 4 fish. 11th - Colin Stainthorpe - 4 fish. 12th - Phil Mead - 4 lb 04 oz - 3 fish. 13th - Dave Perrett - 3 lb 13 oz - 2 fish. 14th - Paul Kilpatrick - 2 lb 12 oz - 2 fish. 15th - Bernard Vasey - 1 lb 09 oz - 1 fish. 16th - Richard Parkin - 1 lb 03 oz - 1 fish. 1st - Dave Perrett - 5 lb 01 oz - 9 fish. 2nd - Denis Thompson - 2 lb 01 oz - 2 fish. 3rd - James Gilpin - 1 lb 14 oz - 4 fish. 4th - Brian Harland - 1 lb 13 oz - 3 fish. 5th - Phil Mead - 1 lb 08 oz - 3 fish. 6th - Paul Kilpatrick - 0 lb 08 oz - 1 fish. 7th = Rob Allison - 0 lb 07 oz - 1 fish. 7th = Ian Russell - 0 lb 07 oz - 1 fish. 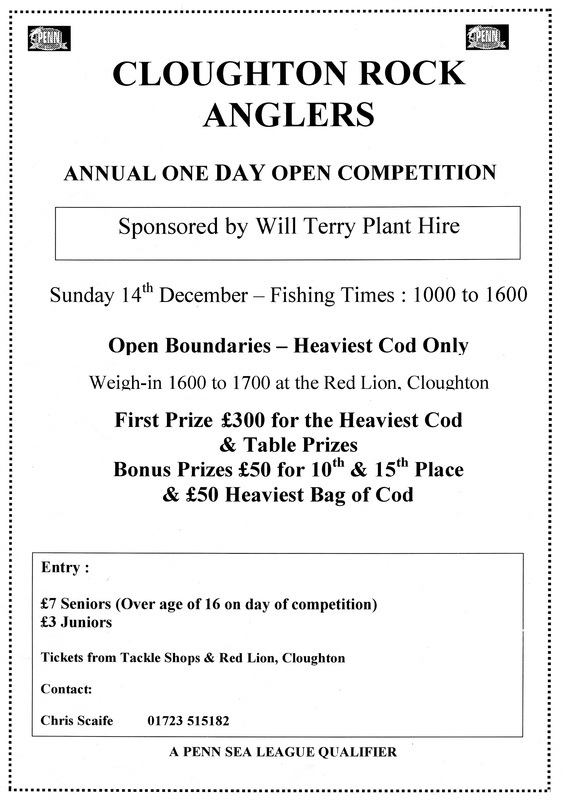 A double figure fish won the Annual Cloughton Open Shore fishing competition fished during the fishing times of 10am to 4pm with the weigh in at the Red Lion, Cloughton. There was a good entry of 95 anglers, 40 weighed in, fishing an ebbing tide into a flooding increasing rough north westerly sea swell. The competition is a Heaviest single Fish match with the prizes presented by County Councillor Bill Miller, the first prize of £300 to this years winner Jeremy Robinson of Scarborough with a fish of 11 lb 06 oz. Second prize of £100 to Andy Barnby of Bridlington 8 lb 15 oz. Third prize of £50 to Brian Bayes of Scarborough 7 lb 00 oz. The £50 prize for the Heaviest Bag of Fish was won by Pete Bayes of Scarborough with 6 fish for 27 lb 13 oz. 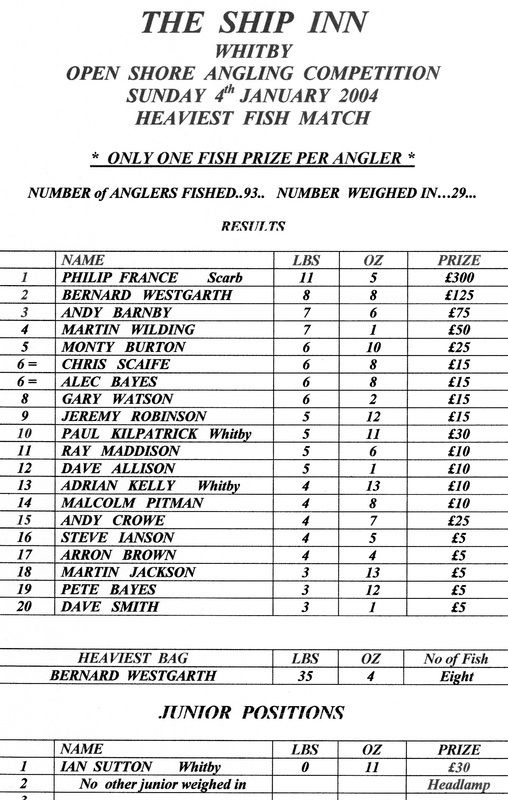 There were two special prizes of £50 each donated by Will Terry Plant Hire to 10th place Chris Scaife of Filey 5 lb 14 oz and 15th place Herbert Wilson of Whitby 4 lb 15 oz. 1st - Jeremy Robinson - 11 lb 06 oz. 2nd - Andy Barnby - 8 lb 15 oz. 3rd - Brian Bayes - 7 lb 00 oz. 5th - Pete Bayes - 6 lb 08 oz. 6th - Richard Parkin (WSAA) - 6 lb 07 oz. 7th - Paul Medd - 6 lb 04 oz. 8th - Mark Wilson (Sleights) - 6 lb 00 oz. 9th - Colin Stainthorpe (WSAA) - 5 lb 15 oz. 10th - Chris Scaife - 5 lb 14 oz. 11th - Rob Allison (WSAA) - 5 lb 11 oz. 12th - Colin Stainthorpe (WSAA) - 5 lb 06 oz. 13th - Steve Ianson - 5 lb 00 oz. 15th - Herbert Wilson - 4 lb 15 oz. The Stiddy, Lythe. 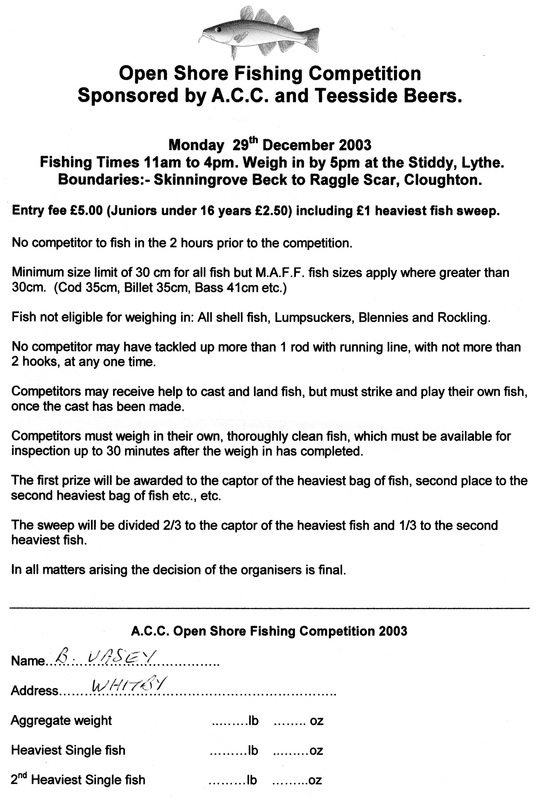 Open Shore angling competition 29th December 2003. The Ship Inn Open, Whitby. 4th January 2004. 18 members entered and 9 weighed in. Members club results. 19 fish for 57 lb 12 oz. After very rough conditions on sunday and monday the sea had calmed for the nights club match which left anglers choosing between the beaches to fish for whiting or to go on the rough ground and try to catch a codling, it was a fine night, casting into a flooding high tide match. 1st - George Middlemas - 7 lb 04 oz - 3 codling off the scaurs. 2nd - Paul Short - 7 lb 04 oz - 10 whiting. 3rd - Rob Allison - 6 lb 06 oz - 11 fish. 4th - Glen Kilpatrick - 5 lb 08 oz - 3 fish. 5th - Dave Perrett - 5 lb 08 oz - 3 fish. 6th - Ian Russell - 4 lb 08 oz - 2 fish. 7th - Jason Ebison - 4 lb 00 oz - 7 fish. 8th - Phil Mead - 3 lb 14 oz - 6 fish. 9th - Mike Vasey - 3 lb 14 oz - 5 fish. 10th - Colin Stainthorpe - 2 lb 06 oz - 3 fish. 11th - Brian Harland - 2 lb 04 oz - 5 fish. 12th - Ian Sutton (Jnr) - 2 lb 03 oz - 4 fish. 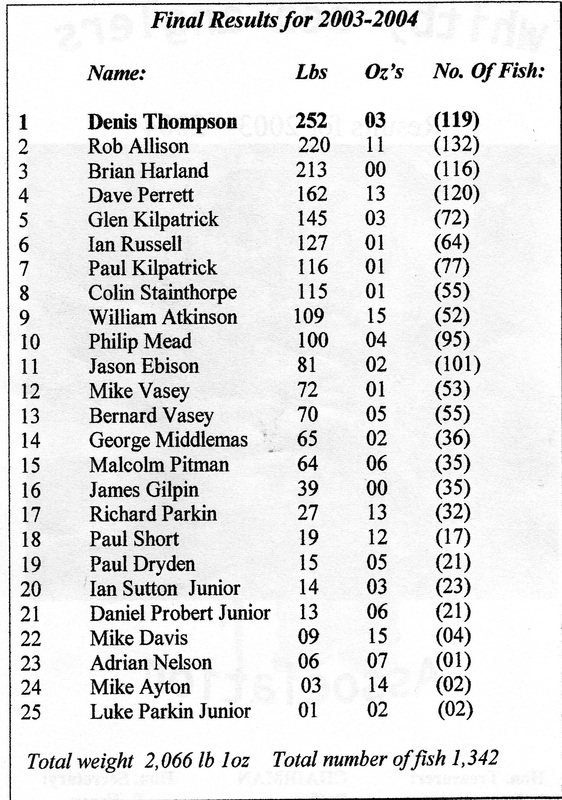 13th - Denis Thompson - 1 lb 01 oz - 1 fish. 14th - Daniel Probert (Jnr) - 0 lb 13 oz - 2 fish. 15th - William Atkinson - 0 lb 11 oz - 1 fish. 16th - Paul Dryden - 0 lb 09 oz - 1 fish. Sunday's match was the annual Christmas match for club members only fishing from 2pm to 7pm with the weigh in at the Fleece, Church Street. The sea conditions were very rough from a north westerly swell which had arrived over the saturday night, but with the high tide at 2 pm many marks were not fishable due to sea and strong gale force gusting winds. Despite this 12 anglers returned with 26 fish all codling. Rob Allison weighed in 7 for 17 lb 05 oz to win him the the Christmas Cup for the Heaviest Bag of Fish . 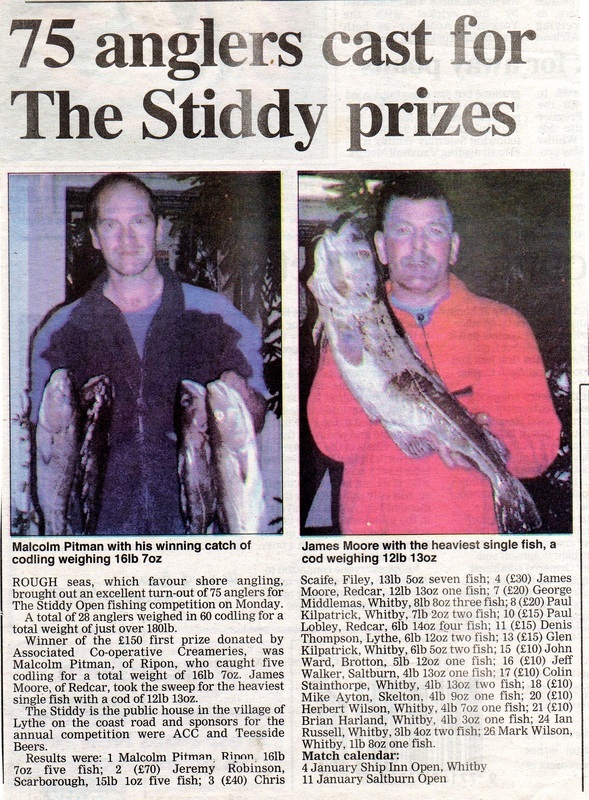 The Heaviest Fish prize was won by Phil Mead with a 6 lb 02 oz cod. Twenty one members entered and 12 weighed-in. 26 fish for 71 lb 03 oz. 1st - Rob Allison - 17 lb 05 oz - 7 fish. 2nd - George Middlemas - 8 lb 15 oz - 2 fish. 3rd - Paul Kilpatrick - 8 lb 04 oz - 4 fish. 4th - Malcolm Pitman - 8 lb 01 oz - 2 fish. 5th - Jason Ebison - 6 lb 05 oz - 2 fish. 6th - Phil Mead - 6 lb 02 oz - 1 fish. 7th - Ian Russell - 4 lb 05 oz - 2 fish. 8th - James Gilpin - 3 lb 02 oz - 2 fish. 9th - William Atkinson - 2 lb 11 oz - 1 fish. 10th - Brian Harland - 2 lb 05 oz - 1 fish. 11th - Mike Vasey - 2 lb 03 oz - 1 fish. 12th - Richard Parkin - 1 lb 09 oz - 1 fish. Rough seas which favour shore angling brought out an excellent turn out of 75 anglers for The Stiddy Open fishing competition on Monday . A total of 28 anglers weighed in 60 codling for a total weight of just over 180 lb. Winner of the £150 first prize donated by Associated Co-Operative Creameries was Malcolm Pitman, of Ripon, who caught 5 codling for a total weight of 16 lb 07 oz. 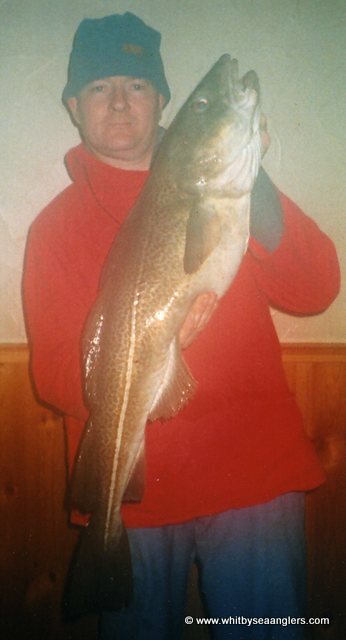 James Moore, of Redcar, took the sweep for the Heaviest single Fish with a cod of 12 lb 13 oz. The Stiddy is the public house in the village of Lythe on the coast road and sponsors for the annual competition were ACC and Teesside Beers. 1st - £150 - Malcolm Pitman - 16 lb 07 oz - 5 fish. 2nd - £70 - Jeremy Robinson (Scarborough) - 15 lb 01 oz - 5 fish. 3rd - £40 - Chris Scaife (Filey) - 13 lb 05 oz - 7 fish. 4th - £30 - James Moore (Redcar) - 12 lb 13 oz - 1 fish. 5th - £20 - George Middlemas (Whitby) - 8 lb 08 oz - 3 fish. 6th - £20 - Paul Kilpatrick (Whitby) - 7 lb 02 oz - 2 fish. 7th - £15 - Paul Lobley (Redcar) - 6 lb 14 oz - 4 fish. 8th - £15 - Denis Thomson (Lythe) - 6 lb 12 oz - 2 fish. 9th - £15 - Glen Kilpatrick (Whitby) - 6 lb 05 oz - 2 fish. 10th - £10 - John Ward (Brotton) 5 lb 12 oz - 1 fish. 11th - £10 - Jeff Walker (Saltburn) - 4 lb 13 oz - 1 fish. 12th - £10 - Colin Stainthorpe (Whitby) - 4 lb 13 oz - 2 fish. 13th - £10 - Mike Ayton (Skelton) - 4 lb 09 oz - 1 fish. 14th - £10 - Herbert Wilson (Whitby) - 4 lb 7 oz - 1 fish. 15th - £10 - Brian Harland (Whitby) - 4 lb 03 oz - 1 fish. 16th - Ian Russell (Whitby) - 3 lb 04 oz - 2 fish. 17th - Mark Wilson (Whitby) - 1 lb 08 oz - 1 fish. 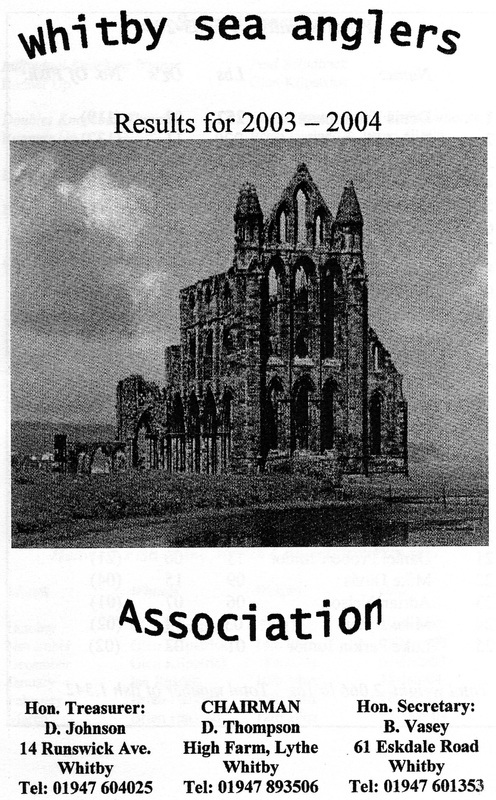 Reproduced courtesy of the Whitby Gazette. Philip France 4th January 2004, 11 lb 05 oz. Photograph by Bernard Vasey. The Ship Inn Open - 4th January 2004. 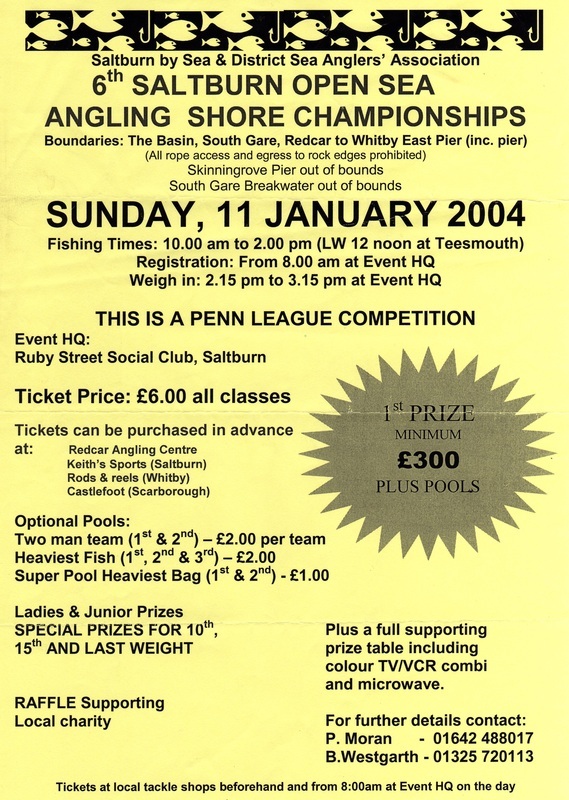 The Annual Ship Inn Open shore angling competition for the heaviest single cod sponsored by Pubmaster was fished on Sunday 4th January 2004. Entries were up on last years event with 89 senior and 5 juniors taking part, fishing from 11am to 6pm on a dry wind free day. The sea conditions had changed over the Saturday night from a calm sea to a growing west north westerly sea swell, but many marks still lacked colour in the water keeping fish further out in deeper gullies resulting in only 29 anglers weighing in. The first place prize of £300 and the Whitby Gazette Trophy were won by Scarborough angler Philip France with a single cod of 11 lb 05 oz. The second place prize of £125 was won by Bernard Westgarth, of Darlington with a 8 lb 08 oz fish. The third place prize of £75 was won by Andy Barmby, of Scarborough with a 7 lb 06oz. 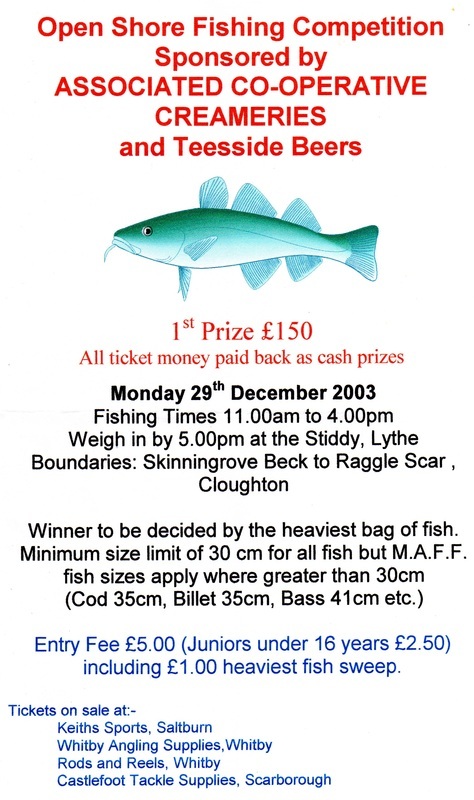 The heaviest bag of fish prize of £25 was won by Bernard Westgarth with 8 codling for 35 lb 04 oz. The junior section event winner was local Whitby Sea Anglers Association angler Ian Sutton who won the prize of £30 with a flattie of 0 lb 11 oz. 2nd - Bernard Westgarth - 8 lb 08 oz - £125. 3rd - Andy Barmby - 7 lb 06oz - £75. 4th - Martin Wilding - 7 lb 01 oz - £50. 5th - Monty Burton - 6 lb 10 oz - £25. 6th = Chris Scaife - 6 lb 08 oz - £15. 6th = Alec Bayes - 6 lb 08 oz - £15. 8th - Gary Watson - 6 lb 02 oz - £15. 9th - Jeremy Robinson - 5 lb 12 oz - £15. 10th - Paul Kilpatrick - 5 lb 11 oz - £30. 11th - Ray Maddison - 5 lb 06 oz - £10. 12th - Dave Allison - 5 lb 01 oz - £10. 13th - Adrian Kelly (Whitby) - 4 lb 13 oz - £10. 14th - Malcolm Pitman - 4 lb 08 oz - £10. 15th - Andy Crowe - 4 lb 07 oz - £25. 16th - Steve Ianson - 4 lb 05 oz - £5. 17th - Arron Brown - 4 lb 04 oz - £5. 18th - Martin Jackson - 3 lb 13 oz - £5. 19th - Pete Bayes - 3 lb 12 oz - £5. 20th - Dave Smith - 3 lb 01 oz - £5. Heaviest bag Bernard Westgarth - 35 lb 04 oz - 8 fish. Junior winner - Ian Sutton - 0 lb 11 oz. Bernard Vasey 5th January 2004. 18 members entered and 7 weighed in. Members club results. 9 fish for 24 lb 10 oz. Mike Vasey, WSAA, 10 lb 01 oz. Reproduced courtesy of the Whitby Gazette. During the Christmas break from club fishing the sea conditions were very favorable as a north westerly sea swell roughed up the sea to bring in plenty of fish to feed. 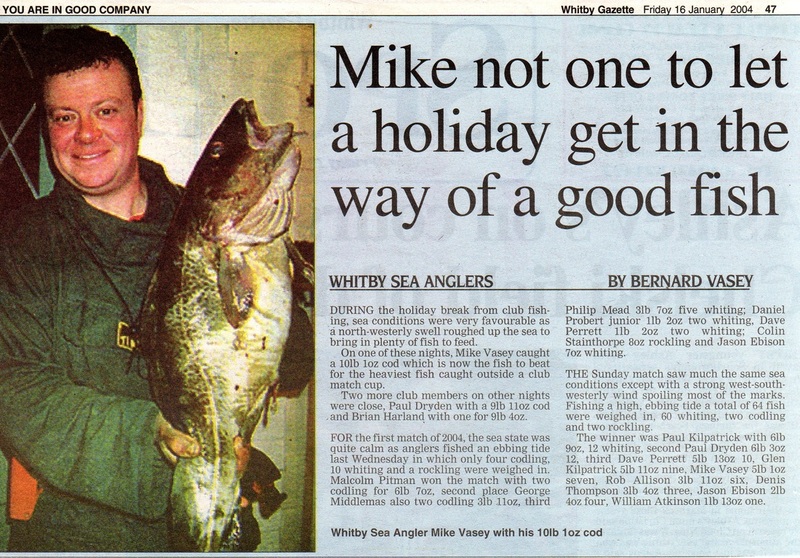 On one of these nights Mike Vasey caught a 10 lb 01 oz cod (as reported above) this is now the fish to beat for the heaviest Fish caught outside of a club match. Two more club members on other nights were close, Paul Dryden with a 9 lb 11 oz cod and Brian Harland with one 9 lb 04 oz. 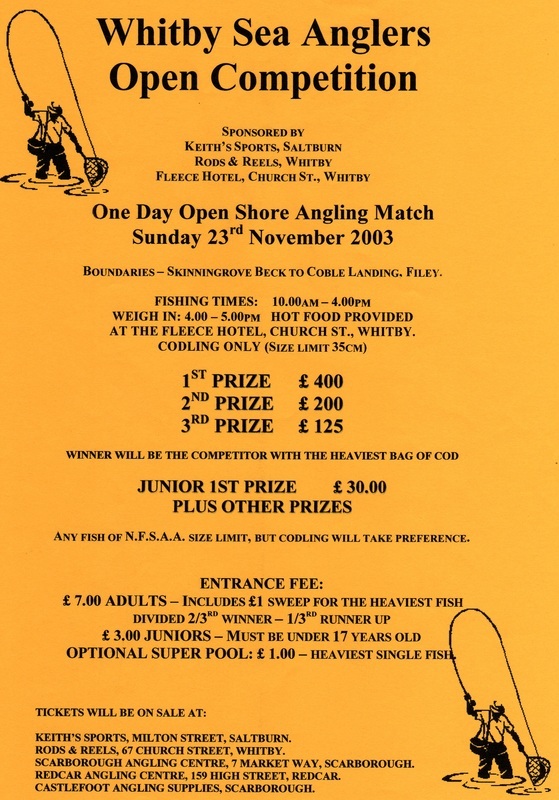 For the first match of 2004 the sea state was quite calm as anglers fished an ebbing tide, in which only four codling, ten whiting and a rockling were weighed in.1st - Malcolm Pitman - 6 lb 07 oz - 2 codling. 2nd - George Middlemas - 3 lb 11 oz - 2 codling. 3rd - Phil Mead - 3 lb 07 oz - 5 whiting. 4th - Daniel Probert (Jnr) - 1 lb 02 oz - 2 whiting. 5th - Dave Perrett - 1 lb 02 oz - 2 whiting. 6th - Colin Stainthorpe - 0 lb 08 oz - 1 rockling. 7th - Jason Ebison - 0 lb 07 oz - 2 whiting. The sunday match saw similar conditions as wednesday except with a very strong west south westerly wind spoiling most of the marks, fishing a high tide ebbing a total of 64 fish were weighed in, 60 whiting, 2 codling and 2 rocklings. 1st - Paul Kilpatrick - 6 lb 09 oz - 12 whiting. 2nd - Paul Dryden - 6 lb 03 oz - 12 fish. 3rd - Dave Perrett - 5 lb 13 oz - 10 fish. 4th - Glen Kilpatrick - 5 lb 11 oz - 9 fish. 5th - Mike Vasey - 5 lb 01 oz - 7 fish. 6th - Rob Allison - 3 lb 11 oz - 6 fish. 7th - Denis Thompson - 3 lb 04 oz - 3 fish. 8th - Jason Ebison - 2 lb 04 oz - 4 fish. 9th - William Atkinson - 1 lb 13 oz - 1 fish. The calm sea conditions from last week continued through for the wednesday nights club match, fishing a 5 metre high tide with very little movement on the shore. Whiting again were the main catch with only 5 small codling and two flatties for a total of 63 fish. Denis Thompson had the heaviest bag wining the match with 8 lb 10 oz with 13 whiting. 1st - Denis Thompson - 8 lb 10 oz - 13 fish. 2nd - Phil Mead - 5 lb 13 oz - 6 fish. 3rd - Paul Kilpatrick - 4 lb 01 oz - 5 fish. 4th - Rob Allison - 3 lb 07 oz - 6 fish. 5th - Paul Dryden - 2 lb 10 oz - 4 fish. 6th - Glen Kilpatrick - 2 lb 03 oz - 2 fish. 7th - Brian Harland - 1 lb 11 oz - 3 fish. 8th - Colin Stainthorpe - 1 lb 08 oz - 1 fish. 9th - Ian Russell - 1 lb 06 oz - 2 fish. 10th - James Gilpin - 0 lb 15 oz - 1 fish. 11th - Daniel Probert (Jnr) - 0 lb 11 oz - 1 fish. 12th - Ian Sutton (Jnr) - 0 lb 07 oz. Ian Russell, WSAA, 18th January 2004. 1 fish of 10 lb 14 oz and the other 8 lb. Reproduced courtesy of the Whitby Gazette. Saturday produced the best rough seas since the Christmas competitions as a northerly swell stirred the sea bed to put plenty of colour back in the water, but this did not last as the swell fell away almost as fast as it came and by the start of the sunday nights match most marks lacked much sea movement. This was low water, into a slow flooding tide match and fished to a constant rain fall and westerly gusts of wind, resulting in two anglers with exceptional double figure bags of fish. With his best bag of the season Ian Russell won with 7 fish for 27 lb 06 oz, one of 10 lb 14 oz this is the heaviest fish for January so far. 1st - Ian Russell - 27 lb 06 oz - 7 fish. 2nd - Denis Thompson - 22 lb 07 oz - 8 fish, one of 9 lb. 3rd - Rob Allison - 8 lb 14 oz - 2 fish. 4th - Brian Harland - 7 lb 03 oz - 1 fish. 5th - Glen Kilpatrick - 6 lb 07 oz - 5 fish. 6th - George Middlemas - 4 lb 15 oz - 2 fish. 7th - William Atkinson - 2 lb 02 oz - 1 fish. 8th - Dave Perrett - 0 lb 11 oz - 1 fish. There was another fine fish of 9 lb 01 oz, weighed in, in tonight's club match, this one caught by Brian Harland who also won the match with the heaviest bag of fish of 12 lb 11 oz - 3 fish. Although the sea conditions were not rough enough anglers were able to follow the tide out and cast into the runs and tangles beds along the scaurs, but catches of codling were lower than expected even though 11 were caught. The second heaviest bag went to Rob Allison with 2 almost identical fish for 8 lb 08 oz. 1st - Brian Harland - 12 lb 11 oz - 3 fish. 2nd - Rob Allison - 8 lb 08 oz - 2 fish. 3rd - Denis Thompson - 5 lb 14 oz - 3 fish. 4th - Ian Russell - 4 lb 02 oz - 3 fish. 5th - George Middlemas - 4 lb 00 oz - 1 fish. 6th - Bernard Vasey - 2 lb 03 oz - 1 fish. 7th - Daniel Probert (Jnr) - 1 lb 03 oz - 3 fish. 8th - Mike Vasey - 0 lb 08 oz - 1 fish. In the 4 hr match whiting were once more the main catch due to fishing a very high water calm tide of 5.6 metres with only close to shore movement from waves on a fine dry cool night a total of 36 whiting, 4 codling and 3 rocklings were weighed in. 1st - Denis Thompson - 6 lb 11 oz - 2 codling. 2nd - Rob Allison - 6 lb 02 oz - 11 whiting. 3rd - Glen Kilpatrick - 5 lb 12 oz - 9 whiting. 4th - Ian Russell - 3 lb 07 oz - 1 codling. 5th - Jason Ebison - 2 lb 09 oz - 2 fish. 6th - Paul Kilpatrick - 2 lb 07 oz - 4 fish. 7th - Mike Vasey - 2 lb 00 oz - 2 fish. 8th - Dave Perrett - 1 lb 12 oz - 3 fish. 9th - Colin Stainthorpe - 1 lb 08 oz - 2 fish. 10th - Richard Parkin - 0 lb 13 oz - 1 fish. 11th - Luke Parkin (Jnr) - 0 lb 11 oz - 1 fish. 12th - James Gilpin - 0 lb 09 oz - 1 fish. 13th = Bernard Vasey - 0 lb 08 oz - 1 fish. 13th = George Middlemas - 0 lb 08 oz - 1 fish. 15th - Daniel Probert (Jnr) - 0 lb 07 oz - 1 fish. Only 10 members of Whitby Sea Anglers fished the match due to heavy snowfalls making difficult road conditions driving to most marks, once there the sea state was very rough stirred up by gale force north westerly winds which also made fishing unpleasant. There was still a good result for 6 anglers who weighed in. 1st - Mike Vasey - 9 lb 06 oz - 1 cod. 2nd - Dave Perrett - 8 lb 11 oz - 4 codling. 3rd - Denis Thompson - 1 lb 14 oz - 1 codling. 4th - Ian Russell - 1 lb 12 oz - 1 codling. 5th - Rob Allison - 1 lb 06 oz - 1 codling. 6th - Colin Stainthorpe - 0 lb 10 oz - 1 flatty. The snow had melted for the weekend match and also the sea conditions had settled but leaving plenty of colour in the water with a moderate close to shore sea swell as anglers started the match with 1 hr of ebb left on another windy wet night. There were a few quality fish on the scales with 18 codling, 10 rocklings, 8 whitings and 2 flat fish. There was another good fish of 9 lb 00 oz this one caught by Rob Allison in his bag of 19 lb 08 oz. 1st - Rob Allison - 19 lb 08 oz - 4 fish. 2nd - Denis Thompson - 12 lb 01 oz - 3 fish, two over 5 lb. 3rd - Ian Russell - 8 lb 02 oz - 3 fish, one over 6 lb. 4th - Bernard Vasey - 7 lb 03 oz - 6 fish. 5th - William Atkinson - 5 lb 08 oz - 3 fish. 6th - Glen Kilpatrick - 5 lb 02 oz - 2 fish. 7th - Paul Kilpatrick - 4 lb 04 oz - 2 fish. 8th - Brian Harland - 3 lb 00 oz - 2 fish. 9th - Richard Parkin - 2 lb 13 oz - 4 fish. 10th - Mike Vasey - 2 lb 09 oz - 1 fish. 11th - Jason Ebison - 2 lb 06 oz - 2 fish. 12th - Phil Mead - 1 lb 15 oz - 3 fish. 13th - Dave Perrett - 1 lb 11 oz - 3 fish. 14th - Colin Stainthorpe - 0 lb 11 oz - 1 fish. 15th - Ian Sutton (Jnr) - 0 lb 10 oz - 1 fish. 16th - Luke Parkin (Jnr) - 0 lb 07 oz. It was another night of finding a sheltered mark to cast and fish in the club match as very strong westerly winds made the sea state flat as the tide ebbed on a moo lit night. There was only 10 assorted fish weighed in with the best a 3 lb codling winning the match for Paul Kilpatrick. 1st - Paul Kilpatrick - 3 lb 00 oz - 1 codling. 2nd - William Atkinson - 2 lb 06 oz - 1 codling. 3rd = Glen Kilpatrick - 1 lb 10 oz - 1 fish. 3rd = Dave Perrett - 1 lb 10 oz - 3 whiting. 5th - Jason Ebison - 1 lb 00 oz - 2 whiting. 6th = Colin Stainthorpe - 0 lb 13 oz - 1 rockling. 6th = Richard Parkin - 0 lb 13 oz - 1 whiting. Eleven Whitby club members traveled to Scarborough early Sunday morning to take part in the Annual Inter-Club Knockout Tournament fishing in the boundaries from Hayburn Wyke to Coble Landing, Filey. 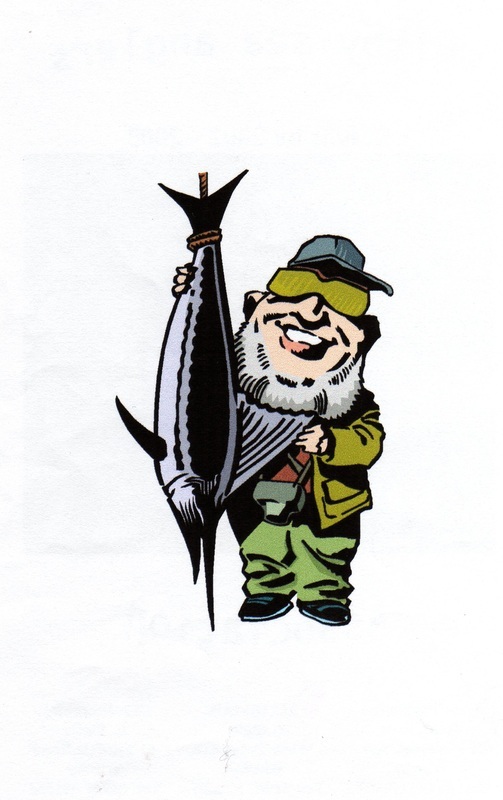 This year was a very good entry with 121 club anglers competing for the "Bell Trophy" fishing from 10am to 2pm. There was a very strong north by north westerly wind which stirred the sea to create a rough sea swell along with wintry cold fishing conditions which resulted in 41 fish for over 80 lb being weighed in. 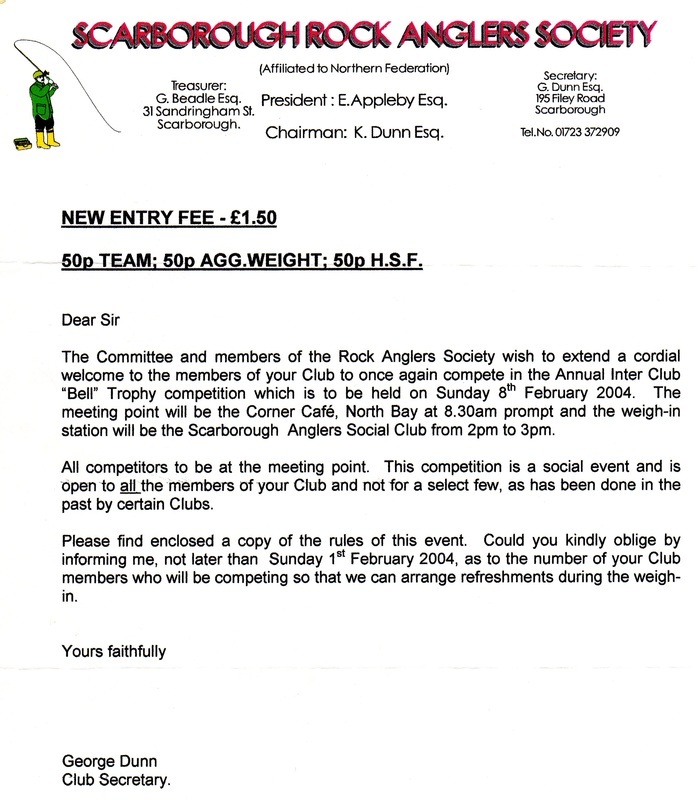 The "Bell Trophy" was won by last years runners up Scarborough Rock Anglers who weighed in 17 lb 05 oz, seven fish for an aggregate weight of 2 lb 02 oz. Second Filey Boats 12 lb 05 oz, nine fish, aggregate 1.4 lb. Third South Cliffe 6 lb 06 oz, one fish, aggregate 0.135 lb. Fourth Seabirds 9 lb 02 oz, four fish, aggregate 0.13 lb. Sixth Filey Brigg 10 lb 10 oz, nine fish, aggregate 0.115 lb. Seventh Bridlington 10 lb 09 oz, four fish aggregate, 0.11 lb. Eighth Scalby Mills 3 lb 06 oz, three fish, aggregate 0.05 lb. Tenth Cloughton - no fish. Rob Allison 4 lb 04 oz, one fish. Paul Kilpatrick 2 lb 12 oz, one fish. Richard Parkin 1 lb 07 oz, one fish. It was a dry warm night with no wind as club members were fishing a 7.25pm high tide with just enough movement from a slight north westerly slow ebbing sea. With the fair conditions and the high tide most anglers were fishing cliff marks which gave a few good results with 10 fish being caught, there was 5 quality codling weighed in. 1st - William Atkinson - 6 lb 08 oz - 2 fish, one a 5 lb 08 oz codling and a billet. 2nd - Bernard Vasey - 5 lb 11 oz - 1 codling. 3rd - Phil Mead - 4 lb 15 oz - 1 codling. 4th = Ian Russell - 4 lb 08 oz - 1 codling. 4th = Malcolm Pitman - 4 lb 08 oz - 1 codling. 6th - Jason Ebison - 1 lb 09 oz - 2 whiting. 7th - Rob Allison - 0 lb 10 oz - 1 whiting. 8th - Mike Vasey - 0 lb 08 oz - 1 flat fish. A slow flooding tide with a northerly moderate sea state with just enough movement close to shore gave William Atkinson a double win in this weeks fishing when he weighed in a double figure bag of 4 codling for 12 lb 04 oz. 1st - William Atkinson - 12 lb 04 oz - 4 codling, best one of 5 lb 03 oz. 2nd - Rob Allison - 8 lb 12 oz - 2 codling. 3rd - Denis Thompson - 6 lb 06 oz - 2 codling. 4th - Phil Mead - 4 lb 15 oz - 9 fish. 5th - Brian Harland - 2 lb 14 oz - 2 fish. 6th - Glen Kilpatrick - 1 lb 08 oz - 1 fish. 7th - Dave Perrett - 1 lb 05 oz - 3 fish. 8th - Mike Vasey - 0 lb 12 oz - 1 fish. Brian Harland returned with 5 fish to win the club match weighing in the 4th heaviest bag of fish this season at 25 lb 07 oz, one fish tipped the scales at 13 lb 01 oz, the second heaviest in the club this season. There were 18 fish, all codling, weighed in, caught from a half tide ebbing to low water with a moderate to rough north by north westerly sea swell. 1st - Brian Harland - 25 lb 07 oz - 5 fish, one of 13 lb 01 oz. 2nd - Bernard Vasey - 9 lb 11 oz - 2 fish, one of 7 lb. 3rd - Colin Stainthorpe - 8 lb 02 oz - 4 fish. 4th - Rob Allison - 6 lb 08 oz - 2 fish. 5th - Malcolm Pitman - 3 lb 11 oz - 1 fish. 6th - Glen Kilpatrick - 3 lb 06 oz - 1 fish. 7th - Paul Kilpatrick - 2 lb 11 oz - 1 fish. 8th - Denis Thompson - 1 lb 12 oz - 1 fish. 9th - Dave Perrett - 1 lb 10 oz - 1 fish. Brian Harland, WSAA, 13 lb 01 oz, part of a 25 lb 07 bag of 5 fish. Photograph by Bernard Vasey. Reproduced courtesy of the Whitby Gazette. Brian Harland 13 lb 01 oz -Wednesday 18th February 2004. Photograph by Bernard Vasey. A poor results for the 4 hr club match as anglers faced a wintry night with hail showers and a strong cold north westerly wind making the sea swell very rough. With these conditions and fishing a high tide ebbing, which was surging at times, there was also a problem with loose weed swirling around at the waters edge catching up in anglers lines. Due to all this many marks did not fish resulting in only one lucky angler returning with a good fish, a cod of 3 lb 07 oz caught by Paul Kilpatrick. This match was this seasons lowest weigh in. 1st - Paul Kilpatrick - 3 lb 07 oz - 1 codling. The rough seas continued fro last sunday's match into the mid-week competition and anglers again having to find sheltered marks to fish from strong winds on a cold dry frosty night. It was a high water tide match starting with long distance sea swells running in towards shore creating too much white water which most types of fish prefer not to venture into, this keeping them out of casting reach in deeper water. As like sunday another poor result when all but one member returned with empty fish bags. 1st - Colin Stainthorpe - 1 lb 11 oz - 1 fish. The sea state was a much settled event as a moderate inshore north easterly swell and a slow 4.1 metre flooding tide had a better result than the previous two matches. Eleven codling and two rocklings were weighed in with Brian Harland again finding a fine fish of 6 lb 10 oz, in his winning catch of five fish for 12 lb 15 oz. 1st - Brian Harland - 12 lb 15 oz - 5 fish, one of 6 lb 10 oz. 2nd - Dave Perrett - 5 lb 01 oz - 2 fish . 3rd - Denis Thompson - 3 lb 11 oz - 2 fish. 4th - Phil Mead - 2 lb 13 oz - 1 fish. 5th - Paul Kilpatrick - 2 lb 01 oz - 1 fish. 6th - Bernard Vasey - 2 lb 00 oz - 1 fish. 7th - Jason Ebison - 1 lb 15 oz - 1 fish. One of the best times of tide most anglers prefer was fished in last nights club match, an ebbing to low water which enables them a choice to fish along the scaurs into the tangles and deep water runs and gullies. Although the time was good, the sea state only had a moderate slight south easterly close to shore movement, which failed to stir the fish into feeding as bites were very few which resulted in only 5 fish being caught. 1st - Colin Stainthorpe - 7 lb 02 oz - 2 fish, 1 codling of 6 lb 11 oz and a rockling. 2nd - William Atkinson - 2 lb 03 oz - 1 fish. 3rd - Phil Mead - 1 lb 11 oz - 1 fish. 4th - Paul Short - 1 lb 05 oz - 1 fish. 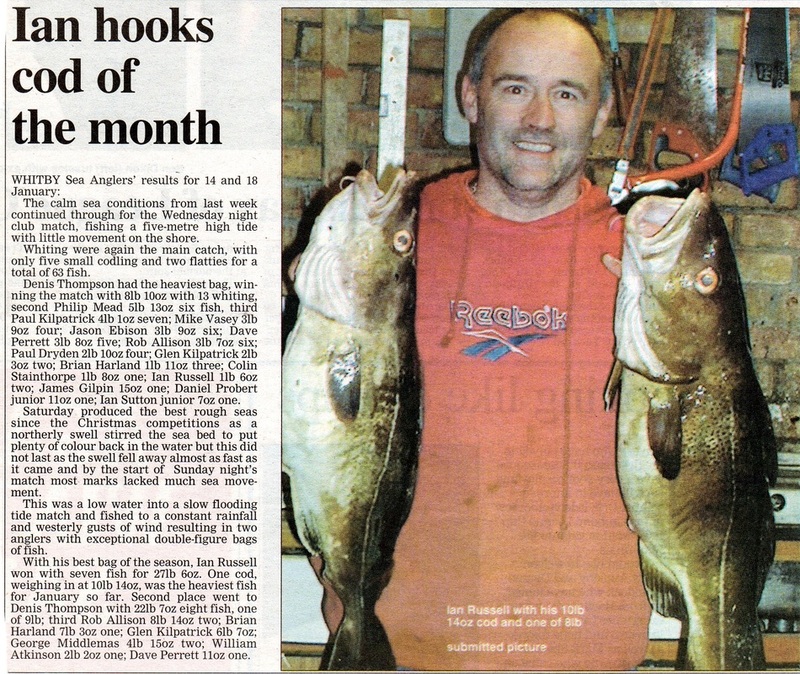 Brian Harland won the heaviest fish of the month for February with a 13 lb 01 oz cod and in last nights match he hooked into another good fish of 12 lb 10 oz, to set a high target in the last month of Whitby Sea Anglers Associations 2003 - 2004 Season. Most of the fishing marks had very little movement as anglers fished another ebbing tide. 1st - Brian Harland - 19 lb 07 oz - 3 fish. 2nd - Jason Ebison - 4 lb 05 oz - 2 fish. 3rd - Glen Kilpatrick - 3 lb 15 oz - 2 fish. 4th - Mike Vasey - 2 lb 11 oz - 2 fish. 5th - Dave Perrett - 2 lb 01 oz - 1 fish. 6th - William Atkinson 2 lb 00 oz - 1 fish. Good sea conditions brought a few fresh run codling although not in quantity closer to shore in the evening match fishing a south easterly ebbing high tide and a running rough swell. There were 9 codling and a rockling weighed in, the best bag of two fish was caught by Denis Thompson with 12 lb 05 oz, one of 9 lb 06 oz, his best this season. 1st - Denis Thompson - 12 lb 05 oz - 2 fish, one of 9 lb 06 oz. 2nd - Bernard Vasey - 4 lb 00 oz - 2 fish. 3rd - Dave Perrett - 3 lb 05 oz - 1 fish. 4th - Malcolm Pitman - 2 lb 15 oz - 2 fish. 5th - Phil Mead - 2 lb 07 oz - 1 fish. 6th - Mike Vasey - 2 lb 04 oz - 1 fish. 7th - Brian Harland - 0 lb 07 oz - 1 fish. 1st - Denis Thompson - 4 lb 13 oz - 3 fish. 2nd - Brian Harland - 1 lb 08 oz - 3 fish. 3rd - Jason Ebison - 0 lb 13 oz - 1 fish. 4th - William Atkinson - 0 lb 10 oz - 1 fish. 5th - Rob Allison - 0 lb 09 oz - 1 fish. 1st - Colin Stainthorpe - 4 lb 08 oz - 1 fish. 2nd - Malcolm Pitman - 4 lb 00 oz - 1 fish. 4th - Mike Vasey - 1 lb 04 oz - 1 fish. 5th - Denis Thompson - 0 lb 08 oz - 1 fish. 1st - Brian Harland - 11 lb 02 oz - 2 fish. 2nd - Dave Perrett - 6 lb 05 oz - 1 fish. 3rd - Paul Kilpatrick - 3 lb 13 oz - 1 fish. 4th - William Atkinson - 1 lb 08 oz - 1 fish. 5th - Mike Vasey - 1 lb 02 oz - 1 fish. 1st - Colin Stainthorpe - 14 lb 08 oz - 2 fish. 2nd - Denis Thompson - 4 lb 14 oz - 1 fish. 3rd - Rob Allison - 4 lb 07 oz - 1 fish. 4th - William Atkinson - 3 lb 03 oz - 1 fish. 5th - Brian Harland - 2 lb 09 oz - 1 fish. 6th - Malcolm Pitman - 2 lb 08 oz - 1 fish. 1st - Jason Ebison - 1 lb 10 oz - 3 fish. 2nd - Rob Allison - 1 lb 09 oz - 2 fish. 3rd = Dave Perrett - 0 lb 09 oz 1 fish. 3rd = Brian Harland - 0 lb 09 oz 1 fish. 5th - William Atkinson 0 lb 07 oz - 1 fish. 1st - Denis Thompson - 0 lb 13 oz - 1 fish. Re typed from Bernard Vasey's original reports submitted to the Whitby Gazette. Hopefully the original photographs will be found.